Whether it’s loft-style living or casual elegance, Camden Brookwood has the perfect urban studio, one or two-bedroom apartment home for you. Custom details such as contemporary interiors, stainless steel appliances including a microwave, granite countertops, concrete ceilings, and USB outlets to charge your devices are available in some floor plans. A full-size washer and dryer and large closets add to the convenience when you make Camden Brookwood your new home. Located between Buckhead and Midtown, we are also near the Northside Trail of the Atlanta BeltLine. The Northside Trail was the first segment of the Atlanta BeltLine trail to open on the north side of Atlanta, and it serves a connector for the two previously existing trails. We are also only a mile from the Piedmont Atlanta Hospital. You will enjoy our non-smoking community including the amenities we have to offer. We are one of the few apartment communities to welcome three pets per apartment and your dog(s) will love to run free in our fenced-in dog park. Our pool is calling your name! Put your feet up and enjoy the weather on our sundeck next to the salt water swimming pool and relaxing serenity fountain. Grill some burgers and hotdogs with your friends at our outdoor grilling stations or gather around the outdoor fireplace. Do you like to work out? Our fitness center has cardio equipment and free weights to keep you in shape. Make your car sparkle at our car care center and keep it protected from the elements in our covered parking garage. Extra smart space storage is available for all your storage needs. Local historical hot spots are right around the corner, including Mary Mac's Tea Room, The Varsity, and the Fox Theater. We are an ideal location for students because we are close to Georgia Tech and Emory University. In the heart of the city, we are only a few miles from some really great venues like the Georgia Aquarium, World of Coca-Cola, College Football Hall of Fame, Children’s Museum of Atlanta, CNN Studio Tours, Centennial Olympic Park, Philips Arena, Georgia Dome, Underground Atlanta, Ponce City Market, and Historic Fourth Ward Park. It’s time to get your must have season passes to some of our area’s hottest attractions. Residents receive a technology package included in the total monthly rent with a savings of up to 42% off retail. This money-saving package includes high-speed internet up to 150 Mbps and over 140 digital video channels through Xfinity. Use the Xfinity Go app on your smartphone or tablet to access your digital video anywhere! Come home to Camden Brookwood. Call today to make an appointment to see your new apartment home! Get the perfect spot! 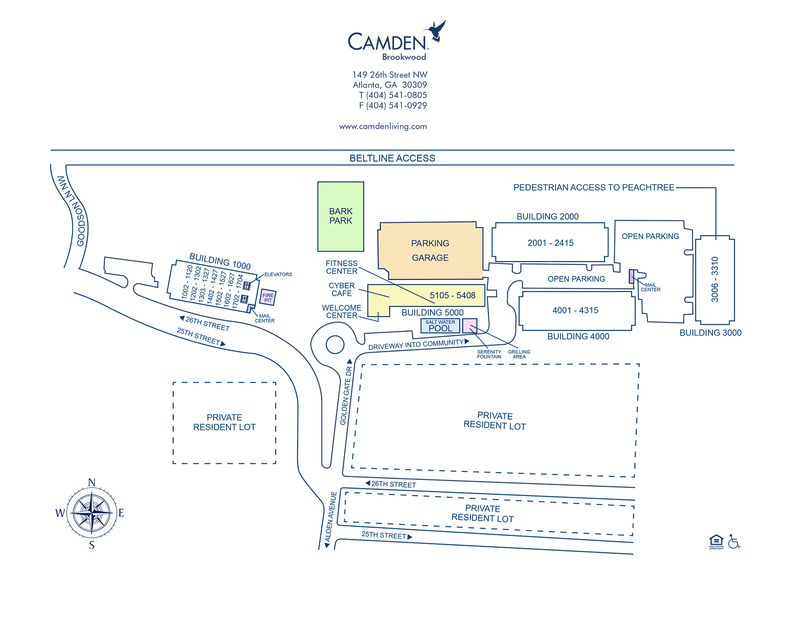 We have parking available for our residents on a first-come, first-served basis. Visitors may park on the top floor of the garage.